Inspiration: Sodomites, All of Them, Steer Well Clear! I say bring them all on! For one evening let the world of political correctness and pomp and circumstance just thaw away. The line is from Brideshead Revisited, a novel by one of the most important Bright Young Things, Evelyn Waugh. I remember this book from high school, although I believe it was not on the syllabus. I enjoyed reading the book and I do remember catching a few of the episodes when I was teenager on Masterpiece Theater. Jeremy Iron’s was simply sublime and I remember soaking up the story lines. Then came the 2008 film, I know critics were rough on the film and held it up to the mini-series. Which I believe was really bad mistake because the series was an extensive rendition of the novel. I mean how can you compare a 11 hour mini-series to a 2 hour motion picture. I think the reason why the critics didn’t like the film is because Emma Thompson was forced to wear that hideous silver haired wig in the film. I agree she was to young to wear such a hideous wig. I personally loved the 2008 film, I fell in love with all the actors. 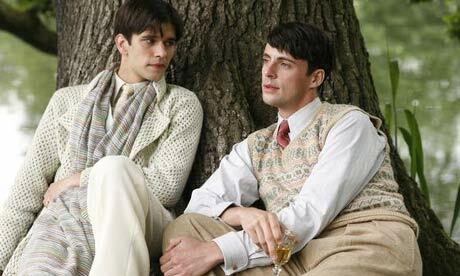 Matthew Goode and Ben Whishaw are personal favorites of mine and their portrayals of Ryder and Sebastian were flawless. Hayley Atwell as Julia was also another powerful portrait. While I love Thompson, I don’t think she played the role cold enough as Mother. In the book I remember mother being ice cold. I recommend seeing both in there entirety at least once in your life. I could watch the movie over and over. The costumes alone are amazing!